The 2015 Pugwash was won by David Bell of the Llandudno MYC he was awarded the replica pugwash clock and the wooden sailing boat trophy. The history of the Pugwash, a non-M.Y.A. team event, is complicated, sufficient to say that it came in to being through the efforts of Ian Taylor of the Southgate M.Y.C. as long ago as 1974, with early events being held at Broomfield Park where in 1985 it attracted an entry of 37 yachts. Latterly it has been contested at Bournville but dwindling entries forced its abandonment a few years ago. The revival took place on a very windy Saturday on West Shore Lake this August. 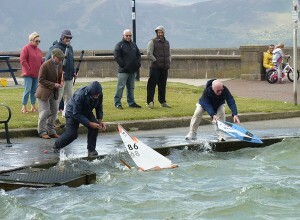 After their successful staging of the 36” Vane Nationals in June, Llandudno M.Y.C. were keen to host a second weekend of inter-club racing this season, the event being was held ‘back to back’ with the Northern District Championship so as to provide two days of racing for visiting skippers. A choppy day for sailing! An initial entry of ten boats was reduced to six on the day, in part due to harsh weather conditions preventing over canvassed yachts from sailing, but also because of injury to some prospective contestants sustained at the recent Vane ‘A’ Nationals at Gosport. In view of the reduced numbers, O.O.D. Graham Reeves ran the race on an individual basis rather than as a team event. After two full rounds the winning skipper was Peter Hopkins of Bournville sailing an ‘Extenshun’, scoring 43 out of a possible 50 points beating Llandudno M.Y.C‘s Michael Smee and David Bell sailing a Mike Dann ‘Gecko’ into 2nd.place with 29 points. Graham Reeves sailing another Mike Dann design, his recently acquired Mark 2 ‘Diversion’, placed third with 23 points. Winning skipper Peter Hopkins was presented with a replica of the Pugwash Clock kindly prepared for the occasion by Graham Reeves and the historic Trophy in the form of a carved sailing yacht.